So what else is happening in Cleveland? Woke up this morning from a three-day NFL Draft stupor and realized there are other things going on in Cleveland sports. Like the first place Cleveland Indians, who took two-out-three from the Angels this weekend. Sunday it was Derek Lowe, who threw 7.2 shutout innings to run his record to 4-1 on the season. His sinker was sharp – he retired 12 Angles on ground balls – and Lowe has pitched at least six innings in all four of his wins. 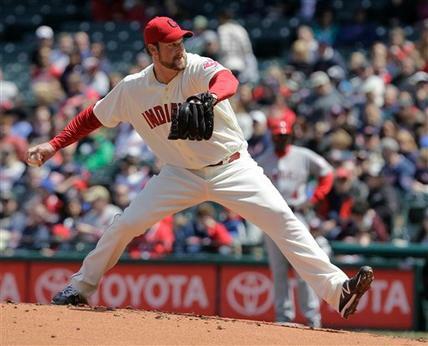 The starting pitching was dynamite all weekend, as Justin Masterson went 8.1 innings on Friday night, giving up four hits and two runs, while Jeanmar Gomez scattered five hits and just two runs over six innings of work Saturday night. The Tribe is one game up on the White Sox and the “unbeatable” Tigers in the American League Central Division. Despite having the greatest offense since the 1927 Yankees, the Tigers have dropped eight of their last 10. The Indians now hit the road, where they are 7-2 this season, starting Tuesday when they face the White Sox in a three-game series before coming back home to face Texas. Great news for the Cavs as they will pick no lower sixth in this summer’s NBA Draft after winning a coin flip to break a tie with New Orleans. That works, as the draft is expected to be six players deep with Kentucky’s Michael Kidd-Gilchrist and Anthony Davis, Florida’s Bradley Beal, North Carolina’s Harrison Barnes and Connecticut’s Jeremy Lamb and Andre Drummond among the top players. Sorry, we have to sneak in a little Browns talk, as the team is looking to bring in about 14 or 15 undrafted free agents. Finally, proving once again why Kent State is the top journalism school in Ohio, comes the story of professor Karl Idsvoog’s computer-assisted reporting class. The class used public records and interviews to examine the car policies of athletic departments in the MAC and at other schools in Ohio.